Winner of 2017 Brick Awards - Best Commercial Building and Best Innovative Use of Brick and Clay Products. Also highly commended in Urban Regeneration Category. Also Winner of RIBA National Award 2017, RIBA Yorkshire Award 2017 and RIBA Yorkshire Building of the Year, plus the Best Retail Project Worldwide in the 2017 WAF World Architecture Festival in Berlin and the Best New Shopping Centre at the MAPIC international property conference. Brick - Staffordshire Red Brick Slips, Staffordshire Red Special Bricks and Staffordshire Red bespoke "snap headers"
The new Victoria Gate Arcade in Leeds has set a new standard for innovative building with brick. 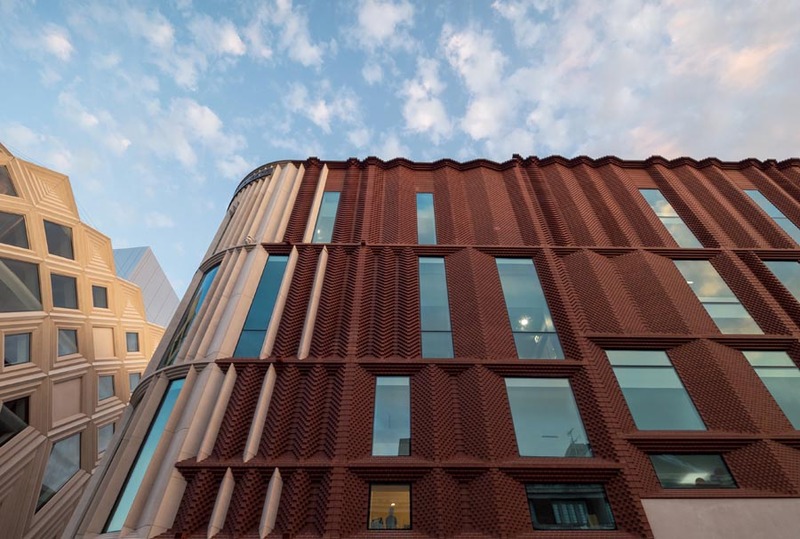 It uses a variety of bespoke Ketley bricks and specials in a blend of light and dark red in conjunction with Ketley brick slips to create precast brick faced panels which have been arranged in a complex geometry with steps and pleats to form an innovative 3 dimensional masonry façade. This project is a fine example of how precast technology is a modern day ally of the brick manufacturing industry, and how the two industries can work together successfully, to advocate the use of traditional brick on the most challenging of building facades. With a building of this scale and complexity, 3D software was used to plot and place every individual brick, there were approx. 360,000 used in total across 550 precast panels. Sourcing the appropriate brick material was key to the success of this project to meet the Architectural and Planning requirements for the Old Victorian Quarter. 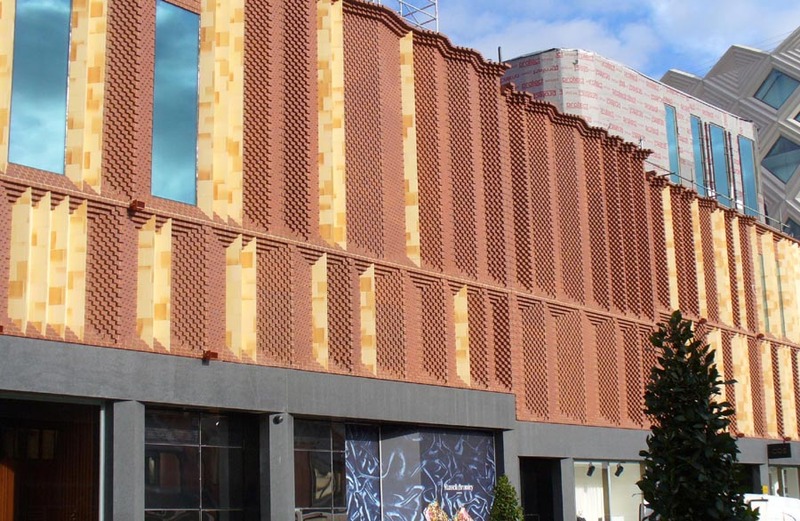 The colour of the brick was very important both to Hammerson, developers of this prestigious retail arcade and to the planners Leeds City Council. Some variation within the red was required and Ketley supplied both light and dark Staffordshire red bricks which were mixed to good effect before being assembled into the panels. 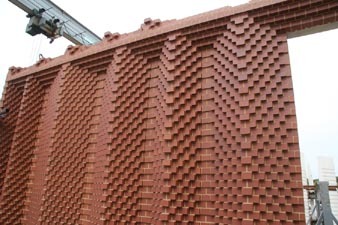 Equally important, the bricks required the appropriate technical characteristics of dimensional stability, strength, low water absorption and high frost resistance, as the projecting headers means the brick bed faces are exposed. 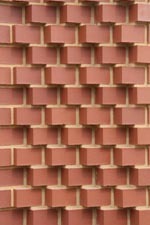 Mock up panels were cast featuring the projecting brickwork detailing and factory pointing with the preferred mortar colour and joint profile to undergo rigorous freeze thaw cycles and pull off tests at an independent laboratory testing facility. Ketley Staffordshire Smooth Red Class A Facing bricks proved not only entirely fit for purpose, but also allowed a special design to be developed by Thorp incorporating a unique perforation and snaps, generating two suitably keyed snap headers for casting purposes when broken in half without the need for cutting, allowing full use of each brick with barely any waste. With durability and longevity in mind the panel geometry was specifically designed to prevent Pidgeon’s from roosting on the exposed decorative brickwork ledges. 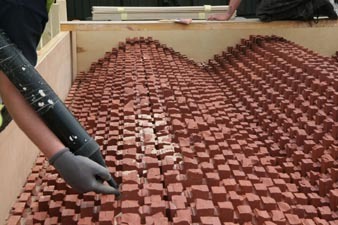 Each brick and brick slip was carefully placed face dwon into a specially designed mould containing a negative of the pleated panel pattern and the concrete was then poured on top to a depth of 150-400mm. Ince the concrete had cured sufficiently, the panels were removed from the moulds and the bricks pointed in factory controlled conditions before they were delivered to site for installation. Offsite construction allowed Thorp to control the quality of the finish of every panel by completing them at their workshop and delivering it ready to be fixed onsite to the steel frame of the development. 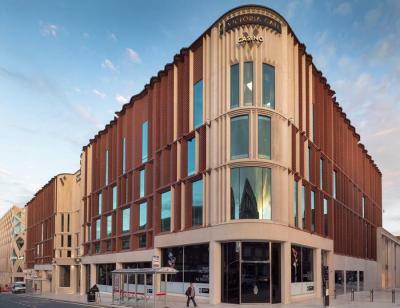 The finished project has become the city of Leeds latest landmark and its complex, innovative design of pleated brickwork sits harmoniously with the richly textured historic brick of the surrounding architecture.